Can’t seem to get your books closed? Tired of Getting Late, Inaccurate, or Confusing Reports? Do you receive accurate, meaningful financial and job cost reports every month? Do your reports make sense? Are they helpful? Are your job costs properly assigned? Do your “Costs by Job” agree with your company totals? Are all of your bank and credit cards reconciled each month? Are your valuable accounting records backed up? 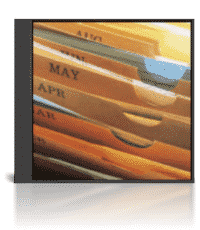 Is your QuickBooks file formally closed (to protect against unwanted changes) each month? 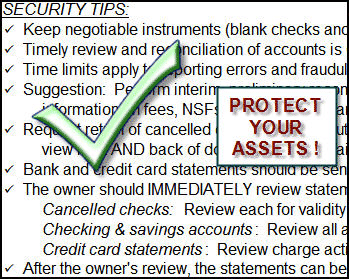 Are you aware of, and have you implemented, basic anti-fraud controls? If you answered “No” to any of these questions, it’s not your fault. Unless you’ve been working with a professional accountant who helped you create closing procedures for QuickBooks, you probably haven’t realized how a standardized, date-driven month-end closing process can become a powerful tool to help you extract the accurate, timely results you need from your accounting system. 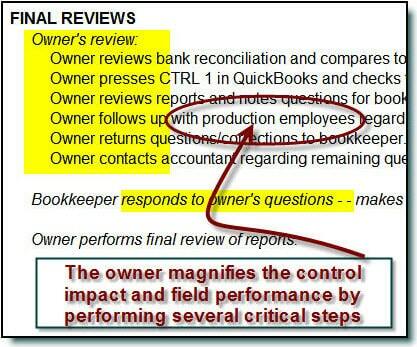 the Quality and Accuracy of Your QuickBooks Financial Reports? Absolutely! 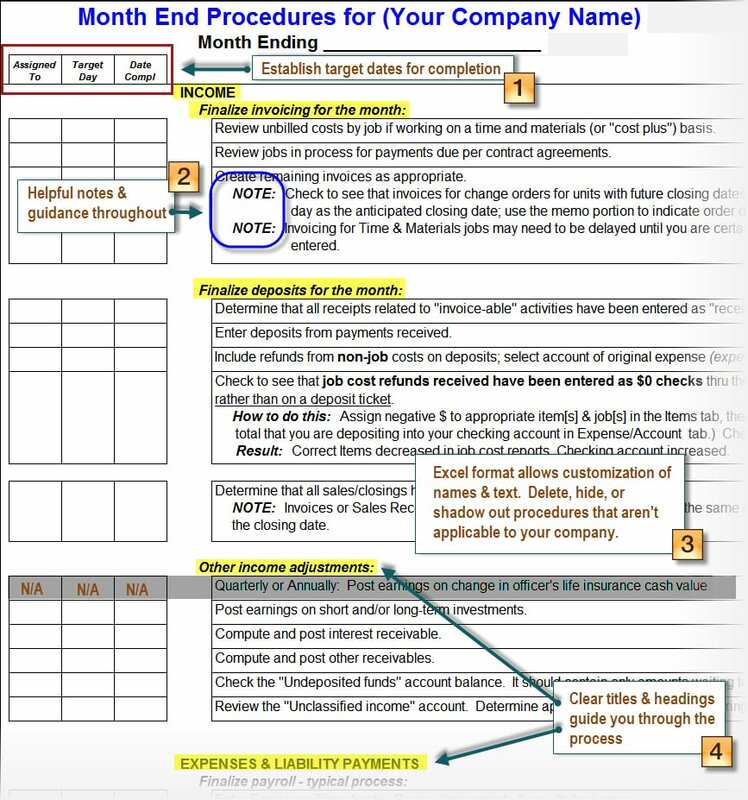 If you (or your staff) can read and utilize a checklist, you (or they) can easily perform the steps outlined in these month-end closing, proofing, and balancing procedures. Simply set your target dates, and then perform the clearly-defined action steps each day until the prior month’s accounting results are finalized (“closed”). You’ll see an immediate improvement in the reliability and usefulness of your critical data. “My books were a mess. I couldn’t get any valuable or correct information out of them and I was trying to manage more ‘by the numbers’… I needed help. The Month-End Closing Procedures product has been important because it helped structure my books correctly and provided a way of managing them. Do All Businesses Need Month-End Closing Procedures? Unless you are a very, very small business, the answer is YES! Every single transaction entered into QuickBooks (or any accounting system) contains a number of fields that need to be completed. No matter how diligent or experienced the bookkeeper or accountant, it’s nearly impossible to enter the thousands of details perfectly every month. And, due to continuing time pressures, without a clearly defined process to double-check results, bookkeepers seldom re-visit their work. The result? Records, files and reports that can contain numerous errors – reports that leave business owners doubting the validity of what they see in their own company’s records! Over the years we’ve observed business after business struggle with this problem! That’s why we created this system of Month-end Closing Procedures. In certain cases, clients have asked us to perform these quality-control procedures on their behalf. But, in most instances, the better long-term solution is to empower your company’s internal bookkeeping staff to learn how to systematically self-review, self-correct, and protect your monthly accounting records, job cost reports, and other valuable financial assets. The result? Owners can finally count on seeing accurate, useful reports each and every month – without needing to rely on expensive, external professional accounting services! 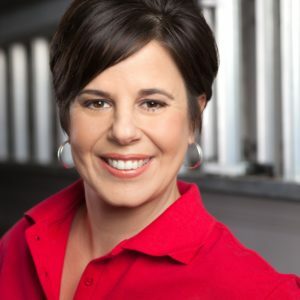 In addition to being an award winning Accountant and QuickBooks Certified Advanced ProAdvisor, Diane Gilson has taught, coached, and advised thousands of QuickBooks users in the construction industry. 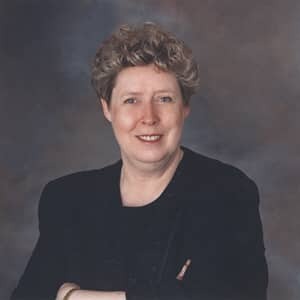 In this program, Diane combines her 30+ years of accounting experience (including 15 years as a CPA and 4 years as a Certified Internal Auditor) with her passion for job costing. Helping company owners, accountants and bookkeepers drive more profits through job-costing and better financial management has been the heart and soul of her business for more than 20 years. What’s the Process to Close the Books at Month End? These closing procedures are organized progressively – so accounting actions and corrections taken during initial steps flow through to later steps. This helps to minimize “circular” re-work or undiscovered errors. Making sure that all Income has been recognized and entered. You will also find it easy to establish and achieve internal target dates, assign accountability for specific procedures, and to customize steps to accommodate conditions unique to your company. Review and customize the checklist, set the dates, and go! Risk Free – Try it Now! Note 1 – Procedures file customized with your company name and delivered via electronic transfer. License valid for one company and one computer. Note 2 – Consultants & Accountants: We love working with consultants and accountants, but please note that this product is NOT licensed for use with multiple entities. If you wish to utilize this product for more than one client, please contact us for helpful insights and discounted licensing arrangements. We appreciate your consideration regarding legal intellectual property rights….